On May 20, the House Transportation & Infrastructure Subcommittee on Railroads, Pipelines, and Hazardous Materials held a hearing to review implementation of the requirements of the Pipeline Safety, Regulatory Certainty, and Job Creation Act of 2011, which amended the federal Pipeline Safety Laws. Witnesses included Cynthia Quarterman, Administrator of the Pipeline and Hazardous Materials Safety Administration, and representatives of the American Gas Association (AGA), the Interstate Natural Gas Association of America, the Association of Oil Pipe Lines, and the Pipeline Safety Trust. A webcast of the hearing and written testimony is available here. PHMSA and the National Association of Pipeline Safety Representatives (NAPSR) schedule public meeting on “Managing Pipeline Cracking Challenges.” On August 5, PHMSA and NAPSR will convene a public meeting on “Managing Pipeline Cracking Challenges.” The meeting’s purpose is to gather and disseminate information on state-of-the-art crack detection techniques for hazardous liquid and natural gas pipelines. The meeting will be held in Chicago and will be webcast. PHMSA and NAPSR schedule R & D forum. On August 6-7, PHMSA and NAPSR will convene a Government/Industry R&D Forum. The Forum’s purpose is to identify key pipeline technical challenges facing the pipeline industry and government, to disseminate information on current research efforts, and to identify new research that can help to address known challenges. The meeting will be held in Chicago. PHMSA Rulemakings. The table below reflects information on the status of PHMSA rulemakings as reported in the DOT’s May Significant Rulemaking Report Additional information from the Office of Management and Budget’s (OMB) Office of Information and Regulatory Affairs (OIRA) is here. New information in the table is reflected in bold. OIRA has received PHMSA’s notices of proposed rulemakings for excess flow valves and the safety of onshore hazardous liquid pipelines. Under Executive Order (EO) 12866, OIRA will review these rulemaking proposals to ensure they are consistent with applicable law, the President’s priorities, and the principles set forth in the EO. OIRA will also ensure the proposals do not conflict with another agency’s policies or actions. Under the EO, OIRA is to provide PHMSA the results of the review within 90 days, unless that period is extended for an additional 30 days. AB 1937 (Gordon): This bill would amend the California Public Utilities Code to require gas corporations to provide at least three working days’ notice before undertaking any non-emergency excavation or construction activity within 500 feet of a school or hospital. AB 1937 passed the Assembly by unanimous vote on May 23, 2014, and has been referred to the Senate for consideration. SB 1389 (Hill): This bill would prohibit a gas corporation from using the “grandfather clause” in the federal gas pipeline safety regulations to determine the maximum allowable operating pressure (MAOP) for an intrastate gas transmission line segment. The federal pipeline safety regulations currently allow operators to determine the MAOP for a gas pipeline by using the highest actual operating pressure that a segment experienced during the 5-year period preceding July 1, 1970. SB 1389 would prohibit the use of that provision and require operators of intrastate gas transmission line to determine MAOP solely on the basis of the California Public Utilities Commission’s rules or orders. The bill unanimously passed the Standing Committee on Energy, Utilities and Communications on May 5 and is pending before the Senate Committee on Appropriations. Public Act 14-94: Governor Dannel Malloy signed new legislation that amends the state’s damage prevention requirements effective October 1, 2015. Under the new law, the discharge of explosives and demolition activities are now subject to those requirements. The state’s public utilities are also required to organize and operate a central clearinghouse for receiving and giving notice to public utilities of these and other excavation-related activities under the direction of the Public Utilities Regulatory Authority (PURA). The law removes the mandatory two-day timeframe for utilities to mark the locations of underground facilities, leaving any time restrictions up to regulations to be issued by PURA, and requires the use of hand- or soft-digging techniques in the vicinity of any facility that contains combustible or hazardous fluids or gases. HB 868 (Ponti): Governor Bobby Jindal has signed new legislation that reduces the civil penalties that can be imposed for violations of the Underground Utilities and Facilities Damage Prevention Law and allows an excavator and operator to extend the 48-hour deadline for beginning excavation activity by mutual agreement. HCR 143 (Stokes): This concurrent resolution urges the Commissioner of Conversation and the Secretary of the Department of Natural Resources, in consultation with the Attorney General and Legislative Auditor, to perform a comprehensive assessment of the hazards posed by pipelines that are inadequately marked, covered, buried, or protected in coastal areas and to make recommendations for any statutory, regulatory, or policy changes necessary to address these concerns. H. 3873 / S. 2073 (House Ways and Means Committee): This bill proposes to incorporate into Massachusetts law the federal limitations on the amount of administrative civil penalties for pipeline safety violations. It would also establish new uniform leak classification standards for gas pipelines, require that consideration be given to creating new standards for performing winter surveillance and patrols of cast iron pipe, and authorize the implementation of a targeted infrastructure replacement program. HB 1867 (Schatz): This bill proposes numerous changes to Missouri’s damage prevention statute, including altering the definitions of “excavation” and a “pipeline facility” and adjusting the requirements for marking underground facilities. It also sets the failure to notify by an excavator and the failure to mark facilities by an owner or operator as a rebuttable presumption of negligence. The bill passed both Houses as of May 16 and is awaiting further action by the governor. A2711 (Handlin): This bill proposes to create the New Jersey Taskforce on Underground Utility Lines for the purpose of studying issues related to placing overhead utilities underground. The bill was referred to the Assembly Committee on Telecommunications and Utilities. Track the bill here. A 9336 / S 7010: These companion bills would require operators of gas distribution facilities to accelerate the repair or replacement of pipe segments that are leaking, are at “high risk of leaking,” or may no longer be fit for service due to inferior materials, poor construction methods, lack of maintenance, or age. The bills would also provide a cost recovery mechanism for the accelerated repair or replacement program. Both bills have been referred to the respective energy committees. HB 483 (Amstutz): The Senate-passed version of this bill proposes to increase the maximum civil penalties for pipeline safety violations to $200,000 per day, per violation, not to exceed $2,000,000 for any related series violations (consistent with federal caps). It would also allow the Ohio Public Utilities Commission to waive the pipe design requirements in Subpart C of 49 C.F.R. Part 192 for operators of “gas gathering pipelines” or “processing plant gas stub pipelines.” While including the latter provision, the House-passed version of this bill did not authorize an increase in the maximum civil penalties that can be imposed for pipeline safety violations. A conference committee will be convened to address these differences. H 7714 Sub A / S 2450 Sub A: These bills would require excavators to provide specific information regarding the location of a planned excavation, including the specific street address for nearby buildings and any other information to assist a utility in determining where the excavation is planned to occur. It would also require that any contact with underground facilities be reported to the affected utility immediately, and that any potential violation of the damage prevention law be reported to the Rhode Island Public Utilities Commission within 30 days. The Rhode Island Senate passed its bill on April 3. The House of Representatives passed its version on May 20 and referred the bill to the Senate Committee on Commerce for consideration two days later. The House bill was referred to the Senate Committee on Commerce on May 22. H 162: On May 20, Governor Peter Shumlin signed legislation that increased the civil penalty limit for violations of the Gas Pipeline Safety Program from $100,000 to $200,000 per violation per day, not to exceed $2,000,000 for any related series of violations (consistent with federal caps). These amounts are identical to the federal limits imposed under the Pipeline Safety Act. Increase the number of National Energy Board (NEB) safety inspections and audits. Impose strict liability of up to $1 billion for incidents on NEB-regulated pipelines and maintain unlimited liability in cases of fault or negligence. 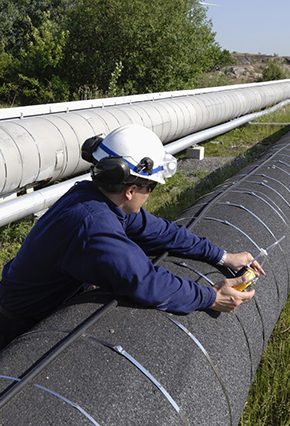 Increase Aboriginal participation in pipeline safety issues and sector employment. Require pipeline operators to demonstrate financial capability to respond to incidents. Allow for NEB to order reimbursement of cleanup costs incurred by the government, and to assume control of incident response efforts in exceptional circumstances. Allow NEB to provide guidance on best available safety technologies. Provide for expanded pipeline safety regulation and public transparency measures. Encourage safety culture and management systems. It is expected that these new policies will be included in a legislative proposal to Parliament. More information is here.